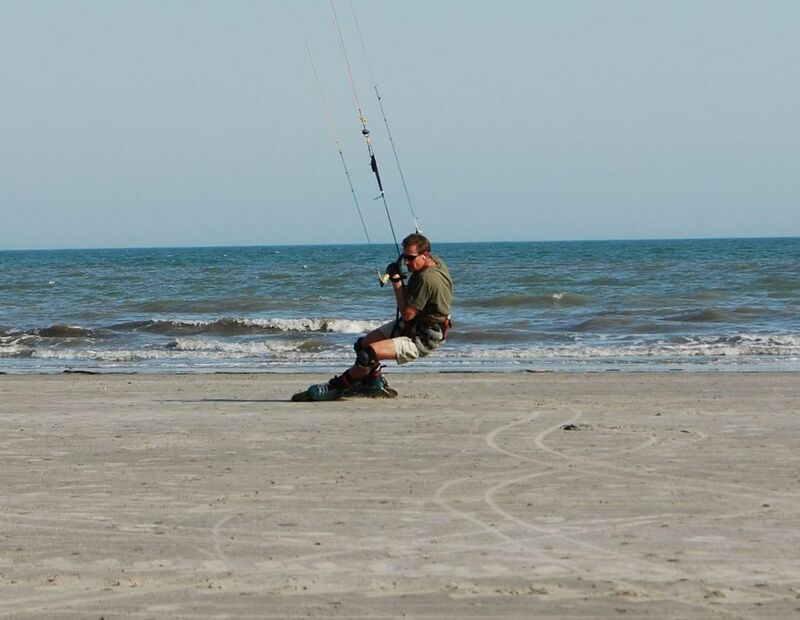 Power Kite Forum - Yeah baby, yeah! AKA, when it all comes together! Author: Subject: Yeah baby, yeah! AKA, when it all comes together! Yeah baby, yeah! AKA, when it all comes together! Finally, after what seems (and was) months of anticipation I had one of those sessions where everything came together. Sunday afternoon with free time, check; wind picking up strongly and in the right direction for the field I had open and available to me, check; 200x50mm wheels of doom set up, check; all the plastic courage I could drape on my body, check; an unexpected fellow kiter on site to revel in the glory, double check! While I didn't measure the wind I'd say it was in the 15mph range with some gusts. I put up the 9m Peak2 which turned out to be just the right amount of kite for the conditions. The wheels offer quite a bit of resistance to the grass which is thick and lush and not cut too close to the ground at this point. Resistance is such that it is awkward to skate free of the kite, but once I started getting pulled things smoothed out very nicely. This setup (wheels of doom with large knobby MTB tires) worked wonderfully for tacking and angulating hard against the pull of the kite and I was able to get some pretty good body position and speed going. Not like I can do on skis, but a darn good start for my first time out. Turns were clumsy and consisted of bringing the kite up high, sheeting out, and stepping around before powering up again. Lots of upside in that part of my game! All in all this was an extremely satisfying session, my first since IBX! The fire is re-lit! Awesome! I'm in the same boat with limited time lately and last Sunday lit the fire again for me. I bet the bigger tires helped a ton. Yup. They were the deal. Just what I needed. Their stoutness were good for setting an edge and holding a line to without side slippage. Plus, and this was purely psychological, when I would look doe at them they just looked the right size and up for the job! All armored up and ready to fly! My wife stopped by right when I was about to get going today and snapped this picture. "Plastic Courage" from head to toe! Damn it. I was sure there would be video. Nice armor. I definitely need some if I want to push myself past where I'm at. it a nice feeling when someone accomplish something . i can't believe it a 55year old man as incipate..lol . That is a good visual of what is meant by having to " step turn " and " carving a turn ". You are carving a pretty tight turn for such a large wheel base! Thanks Ken!! As you know, wheels of doom set ups are great for holding a tack line but not so great in the corners. On a high friction surface like the Ivanpah playa it feels like more or less 95% step turns and 5% carving. On thick grass as I'm on near home maybe this ratio improves to 80/20, with the 20 being in the final parts of the turn once I've re-engaged the power of the kite and I'm dropping it down from zenith to a low pull angle. I'd be curious how this would feel on low-tide sand for example. I suspect it has a bit more lateral give than grass this allowing for a bit more carving. I further suspect I could carve the early portion of the corner more if I was willing to let the kite go high and back in the direction of the intended turn while staying powered up. At my age I'm not sure I'm ready to do that as I know what can easily come next (can you say vert?). Maybe this winter I'll get up the nerve to pull that move in soft snow on skis. The spot I go to where my wife filmed me has a nice hill just beyond where I was turning when I was far from the camera. Under better power I like to decend that hill go across what is the outfield of a baseball field, turn, and then shoot back up the hill. I've launched myself off that lip several times which is really fun. Very small jumps at this point with my skates probably not more than a foot off the ground. Baby steps! Looking fantastic. You build your new skates yourself I assume? Nice to see others still into kite skating! I'd be curious how this would feel on low-tide sand for example. I suspect it has a bit more lateral give than grass this allowing for a bit more carving. With hard pack sand AND a shorter length wheel base like the Coyotes you have... you could be doing such quick short radius turns and carving..... it would feel like a different world. Nirvana. So much less friction or rolling resistance. You would hardly need to step turn unless you are way underpowered(very slow) or stopped. The smaller wheels(150mm) on coyotes would be just right for hard pack sand. You will have to hit the coast one day to find out exactly. If you ever come East to Boston, the Nahant crew will welcome you to our beach, of course. Thanks for the invite Tuckerman! I'd love to take you up on that someday. I had several bucket list locations and now I have one more! JIBE and SOBB are on the short short list. Such great people come to those two events and the locales look great to boot. Get exactly what you are saying about the hard pack sand, coyotes, etc. while I only list my Nordic Scouts currently for skates I actually have three skate frames. I have large (EU48) feet and ended up going with a set of Seba boots from a specialty skate outfitter up in Canada. Under those boots I can bolt two wheels of doom set ups (Nordic Scouts at 200x50 and Powerslide Metropolis SUV at 150x25) and I picked up some Coyotes in eBay that I chucked the boots and kept the frames and wheels. For my grass setup near home the Nordic Scouts work the best. My closest hardpack option from Utah is Ivanpah but the 40wt sandpaper surface wears out Coyote wheels really quickly. Really pleased with the quality! High quality aluminum billet CNCed to perfection. I get exactly what you are saying. To date I've only had three sessions and each one feels better than the last. I'll be ready to try this and other hops sooner than later. Thanks for the tips! I need some armor like yours if I'm going to progress on the longboard any further because crashes will be guaranteed not a maybe. What type of wrist guards are you using? Yup, I use the "not if but when"' logic too. Not listed here is a pair of hockey shorts that fit over the core pads. They're comparively cheap ($15-25). The thought here is to wear them over the core pads so "when" I fall it's the shorts that get scuffed up, not the pads. Brain bucket too of course, but you already have that. Where is that blasted kite squire? I fully realize how much stuff this is and the resultant costs. I'm certainly not suggesting it's all required; simply decide for yourself which major joints are not worth protecting and skip those! I just had a screw put in my good wrist, so now I got a pair. Once the screw is there they say you can't break it again. Ice-hockey goalie pants were key to learning the doom wheels for me. I still wear back protection and mtbike shin- knee guards, plus gloves and brain bucket. My favorite turn on doom wheels was a down loop power slide. First the kite, then the wheels. I'd get to the edge of the runway, send the kite back low,start turning down wind on the short mown grass, get pulled around with a slide, rocket back across the runway, repeat. It came together for me as I was trying to do the 180 hop, but wasn't sending the kite correctly to get air. Sorry to hear about the wrist and screw. These activities aren't for the faint of heart. I'm still easing into the power kite activities. I'm a confident and competent skier (former college racer) and am far more willing to push my personal envelope on skis atop soft Utah powder then on the various surfaces I'm able to shoot across on my wheels of doom. I picture the turn you describe perfectly and it sounds like a blast and a half. I hope to start pushing things in that general direction this winter with skis on my feet. We'll just have to see how far I get on land this summer and fall. All right Steve nice go! can be done even on asphault! the tires will disappear like erasers! like on dry lake slippage can good and bad all about kite balance and how deep you are into the skate, its not gonna happen standing on top ...it will throw you down! you have to break it down to small usable elements you flow together as you spend more time on them , like the hill you described, roll down it(or straight bomb it!) and find the powerslide balance , speed you need to break them loose. its not easy and filled with risk. here's and image (i know no helmet!) demos a turn , kite has to be powered and control to help the moment of lift to make side edge slip and carve, body position countering turn momentum and kite power. hips deep into turn as you would be on downhill ski very much close to mountain. hope it helps . take your time !feel comfortable what you are doing and add small amounts of speed and power ...you are well on your way. Thanks Phree! Superb advice. Thanks for taking the time to be so thorough with you write up. I do look to progress as you write about it. Small baby steps. image title - "when dogs turn on you"
Wind direction was such today that I only had one not so good field option for kite skating. Since a bad day of kite skating far exceeds a good day at home I jumped out anyway. Had a great and lively session with my 12m P2 getting some good solid laps in back and forth across a soccer field downwind to a field house that created a sort of diagonal wind block over half the field. The ends of the fields have stout wood fences and in a fit of pure pilot error I got too close to one and didn't bring the kite around in time to avoid getting slammed into the fence as the kite powered up. Took the blow in my shoulder hip, thigh and head all of which was dorn in the Plastic Couage I have on in a photo above. While the impact was pretty strong I came away essentially unscathed! Hail to Plastic Courage, once again saving my seat meat from some real damage! glad you are ok ! solid sessions have their glitches , you should be stoked! way to get some man! you learned more in the two second " oh #@%$#!z" moment than you could have ever imagined ! All tht gear just to ride on grass, come on. what ya skerd of a papercut from a blade of grass. that's enough gear to wrestle alligators not kiting. 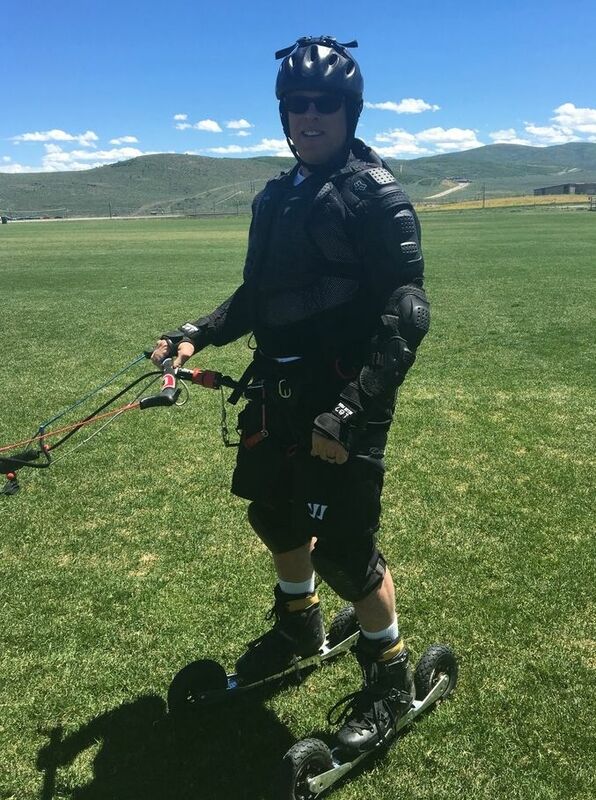 Actually, I bought all that riot gear not for grass but to have on when I kite skate on Lake Ivanpah. The playa there is rock hard and akin to 40wt sandpaper and will wreck your whole day if not your week when you go down hard at high speed. I feel a little sheepish each time I armor up for my grass runs, but as I proved to myself on the 4th even soft grass fields are lined with fences that I can slam into. The other reason is peace at home. My bride puts up with my extreme skiing and kiting adventures but I'm pretty much hanging by a thin thread in that department. Putting all that stuff on keeps her more OK with my antics and that's a GOOD thing. @Phree - I hear you loud and clear about learning more in a few seconds of mistakes and crashes then in all the cruising back and forth. Now whether it sinks into my noggin or not is a whole other matter but I once again learned that my #1 responsibility is to keep track of my kite. I was flying my 12m Peak-2 and it turns like a slow barge. I simply didn't allow for enough time to swing it around before I ran out of track and then I was looking at the rapidly approaching fence instead of the kite and it dive bombed into the power zone which made me hit the fence even harder than necessary. Doh! try to keep your course simple and repetitive. you want mindless reflexes to develop, not wondering about with chaotic action. LOOK where you are going stop looking at the kite, the bar/harness will tell you everything you need to know about the kite. navigate early! , stay on course , THE most important element is good body position and speed control ...then slowly add speed to laps and transitions as mindless reflexes improve and free up noggin space for progressive action ---> deepen stance , powerslides, acceleration, edge control , higher navigation and faster downwind returns. All great advice and greatly appreciated. I usually do look where I'm going as compared to looking at the kite and do rely on feedback from the bar and harness for guidance. The problem sometimes, and this time in particular is the nature of the wind combined with a particularly large kite (wind swirling due to a diagonal wind block from a large and close upwind building and the barge like 12m P2) can make for bad kite behavior. In this instance the kite simply didn't turn despite full bar actuation. On this particular turn the way I got the kite to finally turn was by reaching up and grabbing the right brake line and pulling it towards me. By the time that worked the rest had gone to hell and whammo, into the fence went I! light air compensation certainly adds to it, you have to use deep reach to get the action you want , adding to the already early navigation. abit more air will make the "whole system" work more efficiently and predictably. small steps to get speed control and "brakes " worked out. just keep at it .